Implementing an email filter for an Exchange Server is one of the most proactive steps an organization can take in order to prevent unwanted spam, increase protection against email-borne threats and ensure email continuity during downtime. Although Exchange Servers provide a degree of email filtering by default, the software provided lacks the key tools to enable the detection of sophisticated spam and malware. An email filter for an Exchange Server resolves this issue with real-time spam detection and powerful anti-virus software. Exchange Server email filters also provide email continuity. This can be critical for an organization in the event of downtime during an outage, hardware failure or natural disaster – allowing communication to continue, and preventing loss of business and loss of credibility. Exchange Server email filters use multi-layered security mechanisms to assign each inbound email a spam confidence level. Each email is checked against a blacklist of IP addresses from which spam email has originated in the past and analyzed for compliance with sender policy frameworks. If an email exceeds a specified spam confidence rating it is tagged and either sent to the intended recipient tagged as spam, quarantined or deleted. The filter then produces a report of all tagged/quarantined/deleted emails so that genuine emails can be reinstated and their senders added to a whitelist. An email filter for an Exchange Server also scans outbound emails to check for any content or attachment that could be flagged as spam by a global blacklisting agency. This prevents an organization´s IP address being included in a blacklist, with a subsequent delay in the delivery of emails sent by the organization until the issue is resolved. In order to evaluate an email filter for an Exchange Server, you need to start by comparing it against the premium service offered by Microsoft – “Exchange Online Protection” (EOP). EOP replaced the company´s “Forefront Protection for Exchange” when Exchange 2013 was released; but unlike its predecessor, EOP is only available as a cloud-based service. There are several known issues with EOP that make it a poor substitute for a third party email filter for an Exchange Server. EOP lacks real-time dynamic link following, “sandboxing” and “greylisting” – an essential function to detect spam emails. The premium service has also been criticized for having a high maintenance overhead – smaller organizations preferring usability over complex customization options. How is the spam detection rate verified? Is the email filter for an Exchange Server scalable? Does the service provider have knowledgeable and reliable customer support? Can the service provider supply independent testimonials? Depending on the size of your organization and the nature of its business you may have more considerations. For example, organizations with a limited IT budget may demand flexible payment options. Larger organizations may want APIs to integrate the email filter with other management tools, while Managed Service Providers may require deployment in a private cloud and a white label option. SpamTitan has been developing email and web security solutions since 1999. Among our portfolio of products are two powerful Exchange Server email filters – SpamTitan Gateway and SpamTitan Cloud. SpamTitan Gateway is deployed as an on-premise virtual appliance, whereas SpamTitan Cloud is a cloud-based service with multiple hosting options. Both Exchange Server email filters block 99.97% of spam and have a low false positive rating of 0.03% according to the leading independent testing and certification body VB Bulletin. 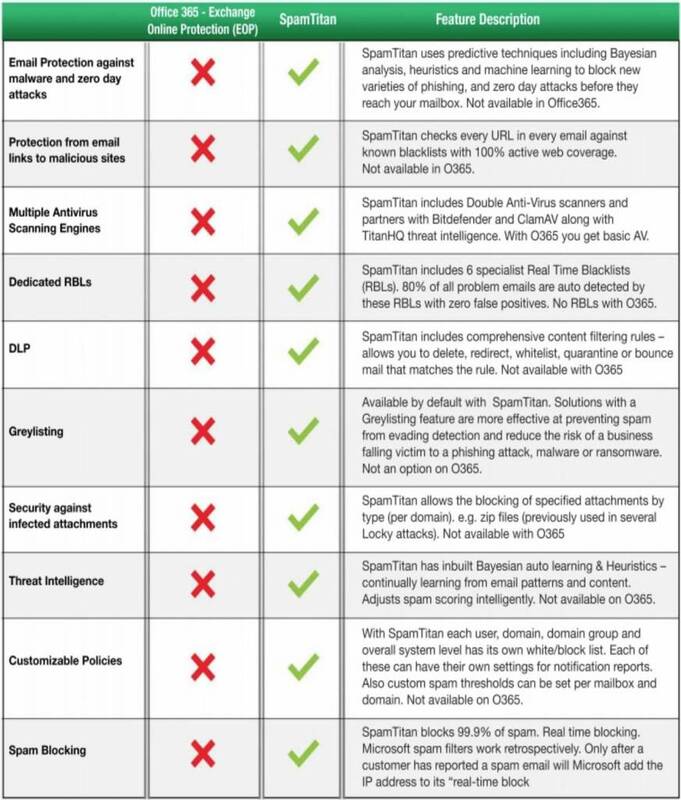 Both SpamTitan Gateway and SpamTitan Cloud use dual anti-virus software from Bitdefender and Clam AV to increase protection against email borne malware, and both are universally compatible. Small organizations, larger organizations and Managed Service Providers will appreciate SpamTitan´s scalability, while detail of our flexible payment options, our comprehensive range of APIs and our white label options are available on request from our industry-leading customer support team. Independent testimonials from our existing database of customers are also available on request. We believe that the best way to evaluate an email filter for an Exchange Server is to give it a test run in your own environment. Consequently we are offering organizations the opportunity to try a fully-enabled SpamTitan Gateway email filter or SpamTitan Cloud free for thirty days with no commitment to continue with the service once the trial period is over. Contact our customer service team to find out more about this offer or to raise any questions you may have about Exchange Server email filters. One of our friendly and experienced team will guide you through the installation and configuration process of your email filter for an Exchange Server in order to prevent unwanted spam, increase your protection against online threats, and ensure email continuity during downtime. How Does SpamTitan’s Spam Filtering Work? Microsoft Exchange security can be significantly improved with the addition of a third-party spam filter such as SpamTitan. 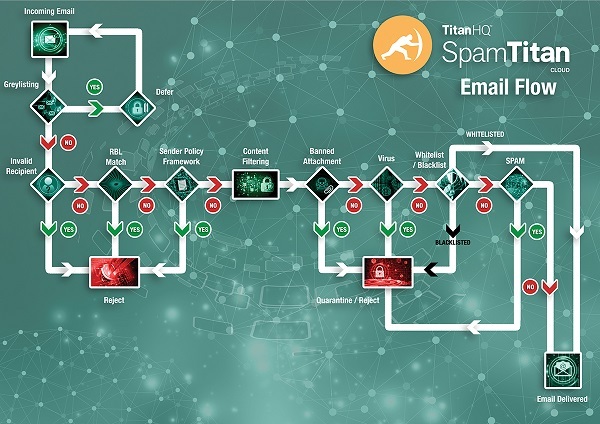 In contrast to Microsoft Exchange and Office 365, SpamTitan uses predictive methods to block new variants of malware, zero-day attacks, and spear phishing attempts that would otherwise be delivered to end users’ inboxes. Like most email service providers, Microsoft has developed its own spam detection mechanisms which will block a percentage of spam emails and malicious messages; but Exchange Online Protection and the antispam controls in Office 365 lack the sophistication to block new variants of malware and are ineffective at blocking many malicious messages that use embedded hyperlinks. The latter are extensively used in phishing attacks. Organizations that rely on the cybersecurity protections of Microsoft Exchange or Office 365 are often frustrated by the volume of spam emails and malicious messages that sneak past the filtering mechanisms. Microsoft Exchange and Office 365 include several mechanisms for detecting spam and malicious messages, but lack the advanced techniques that are now required to block increasingly sophisticated phishing attacks. They are also unable to keep up with volume of new malware variants that are currently being released. SpamTitan on the other hand uses SURBL filtering, Bayesian analysis, machine learning, heuristics, and malicious URL detection mechanisms to catch more spam and malicious messages. Further, twin anti-virus engines provide superior protection against ransomware and malware in email attachments.